The accolade comes in the Year of Homecoming, a year that is already celebrating the 250th anniversary of Burns' birth in the simple thatched cottage in Alloway that you can still visit today. Burns poetry and songs are known throughout the world. Not everyone who will sing the words of Auld Lang Syne at New Year will fully understand this hymn to friendship and good cheer, but many millions will sing it none the less. The Burns section of the Greatest Scot series was introduced by Alex Norton, the actor who plays Detective Matt Burke in STV's long running crime series* Taggart. * Norton himself is a dab hand at Burns songs as he showed in his version of Green Grow the Rashes, O recorded earlier in the year for STV's *Made in Scotland *series. 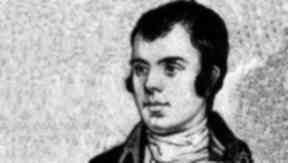 The final order of the top ten was as follows: 1.Robert Burns 2. William Wallace 3. Sir Alexander Fleming 4.Jock Stein 5.David Tennant 6.Robert The Bruce 7.Andrew Carnegie 8.Sir William Alexander Smith 9.Billy Connolly 10.Alex Harvey. Altogether, figures from the world of the arts were well represented, and while some of that may be attributable to recent history and television exposure, the final choice of Burns reflects his timeless appeal, despite a language which even to some modern day Scots is not that easy to follow. So the year of Homecoming which began with a very special Burns supper in Alloway ends on St Andrew's Day with confirmation of Burns' very special position in Scottish hearts. What would he have made of it, one wonders? He would probably have taken a generous dram and reminded us all that a man's a man for a' that. Alan Clements, director of content at STV, said: "The search for our all-time favourite Scot has been a fantastic event and I'm sure the shortlist of nominees has caused much debate and discussion in Scotland and beyond. I'm thrilled that Robert Burns won the public vote in the end. He is a Scottish icon and absolutely worthy of the title Greatest Scot." To honour the winner, STV will commission a piece of contemporary art by a Scottish artist, which will be donated to the nation. The full list of nominees is still available on STV's website.